/ Comments Off on Apple’s Newest Watch Is … Wait, What? It’s an iPod Nano? What time is it? Who cares! Apple’s newest timepiece puts music, photos and step-counting front-and-center, and lets the minutes fall where they may. Sure, you can check the time, but that’s hardly the point with this attractive piece of wrist jewelry. Its unisex design goes equally well with a man’s suit, a lady’s sweater or a jogging outfit. One downside: It doesn’t come with a watchband, so you’ll need to get your own. Fortunately, the clip on the back lets you easily attach it to the strap of your choice. 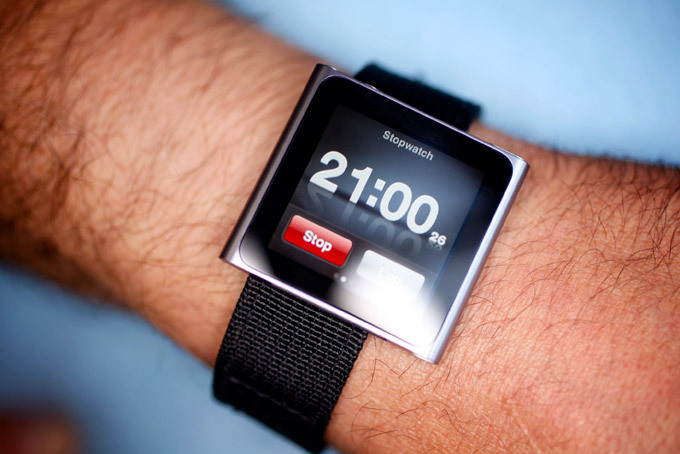 Unlike almost every other watch we’ve tested, Apple’s Nano has a touch-sensitive, high-resolution LCD display. The interface is a little counterintuitive at first, but it’s no more difficult than anything from Tokyo Flash. As a bonus, you can rotate its face with a twisty two-finger gesture, making it work for you in any orientation. Sound quality is excellent, though the generic white earbuds Apple includes are nothing to shout about. There’s a built-in FM radio player for getting your Ira fix (Flatow and Glass) when podcasts are unavailable. Sadly, the Nano doesn’t support wireless or Bluetooth headphones, so you’ll need to route a headphone cable from your wrist to your ears. I recommend running it through your sleeve and under your shirt. This is dorky, but practical. And it kind of makes you feel like you’re an extra on The Wire. The built-in pedometer function sums your steps throughout the day, posting them, if you choose, to Nike’s social site for walkers and general fitness, Nike+ Active. As a timepiece, it’s comparable to digital watches circa 1978: The screen is usually in a black, juice-conserving state, so to check the time you need to press the power button. If you haven’t set it to “show time on wake,” you’ll also need to swipe left or right a few screens to find the clock face. Battery life can also be a problem. Apple says it’s rated for 24 hours of music playback. But I left it on a nightstand overnight, only to find it was depleted in the morning. That doesn’t happen with other watches. And yes, I know it’s really an iPod. I just really like using it as a wristwatch, despite its drawbacks. With a short video review by me (embedded above).